This activity grants permission on the list item. 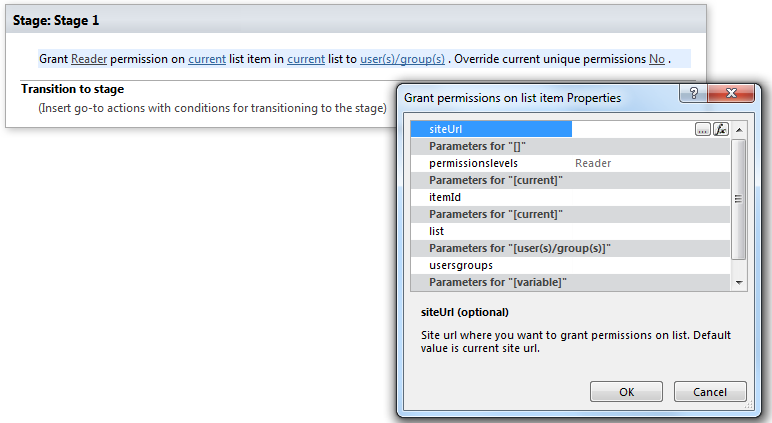 You can override or append user grant permissions. The activity supports multi permission assignment. Use ‘,’ or ‘;’ separator to grant several permission. The following Permission level string. Multi permission assignments are supported. Use ‘,’ or ‘;’ separator to grant several permission. Example: Guest, Reader, Editor, etc. User(s)/group(s) User login, e-mail, group name, group ID “user@domain”, “domain\user”. It allows multiple values separated by a semicolon.